This website consolidates published statistics from cystic fibrosis (CF) patient registries and aims to encourage development of international CF data. Patient registries, often called data registries, are the most reliable source of statistical information about a low-prevalence disease. Because of this, cystic fibrosis patient registries have become well established in more than a dozen countries around the world. They regularly publish information to describe the demographics of CF and to summarise the clinical status, co-morbidity, therapy, medical treatment and survival of persons with CF. Cystic fibrosis care is normally delivered through specialist medical care centres, and extends throughout a patient's lifetime. Good levels of ascertainment can be achieved by data collection through such centres. Because reliable data can be collected, analyses of CF registry data have been increasingly prominent in international CF conferences, such as annual North American and European Cystic Fibrosis Conferences, and are contributing to a growing body of literature. 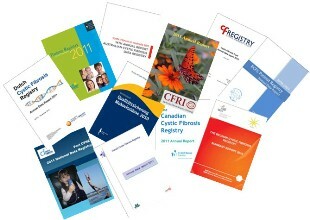 A strong focus on patient outcomes and benchmarking has become evident in conference papers and published articles, making patient registries an integral part of the development of care processes for persons with CF.